Since its introduction in 2011 the Thor movies have struggled to stand out in the crowded Marvel Cinematic Universe, but with Ragnarok Marvel has stumbled on a winning formula. The film takes place two years after the the events of Avengers: Age of Ultron. Thor played by Chris Hemsworth returns home to Asgard after searching the cosmos for further information about the Infinity Stones. When he returns he finds his father, Odin missing and his brother Loki, who was believed to be dead, alive. Upon locating their father Loki and Thor discover that they have a sister, Hela; the goddess of death, played by Cate Blanchett, who was banished by Odin and is returning to take over Asgard as the rightful heir to the throne. The story is predictable and pedestrian, and continues Marvel’s trend of forgettable villains with Cate Blanchett’s Hela getting little screen time with the majority of the story taking place on another planet called Sakaar. But despite the storyline, Thor: Ragnarok is the best Thor movie yet, which if we’re honest isn’t that hard, but it’s definitely worth seeing. Instead of focusing on the antagonist, Waititi instead elects to bring us a more lighthearted and fun movie that brings more personality to its characters. Waititi brings us the most fleshed out Hulk we’ve seen in a MCU movie to date while also introducing us to new characters. The movie shows Hulk as more than just the raging green monster previous films depicted him as, instead portraying him as more lighthearted with his childish bickering with the protagonist. On Sakaar we are also introduced to Korg, played by Waititi himself, whose innocence creates some of the most memorable and funny moments in the film. In regards to the cast, the combination of Hemsworth’s growing reputation for comedy and Waititi’s dry humour means that after three films Hemsworth finally feels at home in the Odin Son’s skin. Jeff Goldblum as the Grandmaster was nothing short of fantastic, but Tessa Thompson’s valkyrie stole the show and in some ways made up for the poor handling of Cate Blanchett’s Hela who makes the most out of what she is given. It is best to think of this movie not as your usual superhero movie but as a self aware comedy that uses the superhero spectacle as a backdrop. Think of it more like Deadpool but without the profanity and nihilism. It continues what Marvel and David Gunn started with The Guardians of the Galaxy movies in bringing fun to the MCU cosmos. 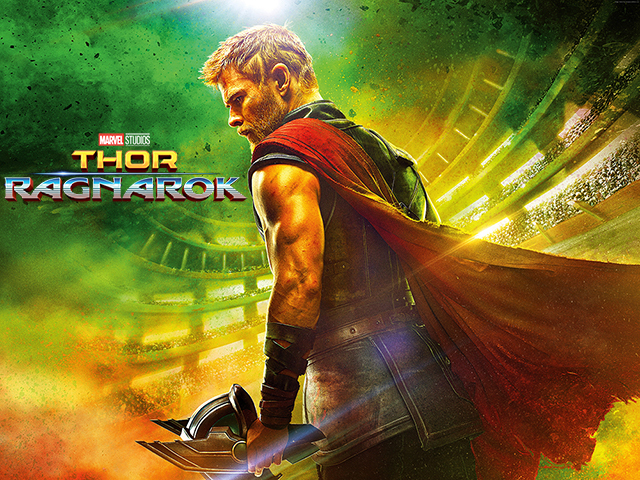 Thor: Ragnarok is a great comedy for family viewing that does a complete 180 degree turn on the previous two films and acts as a great palette cleanser for the upcoming Avengers: Infinity War. But the poor story prevents it from being anything better.